From where I sit, I see steamrollers coming in, clearing the way for short-term economic gain by systematically eliminating the environmental checks and balances that safeguard the health of Canada’s environment. Environmental regulation is being weakened; scientific research is being silenced or eliminated; and the activities of environmental non-profits are being thwarted. Bill C-38 is a 452 page “budget implementation bill” which amends more than 60 diverse social and environmental acts including gutting the Canada’s Fisheries Act, undermining the Species at Risk Act, and repealing the Canadian Environmental Assessment Act. Ecojustice references this as “the most far-reaching and devolutionary reform of federal environmental governance attempted in any one bill ever”. See their analysis of the top environmental concerns of Bill C-38. The Bill also designates $8 million over the next two years to fund “education and compliance activities with respect to political activities by charities” – charities that Natural Resources Minister Joe Oliver has referenced as “environmental and other radical groups”. Bill 37, the B.C. Animal Health Act, has now been withdrawn due to public outrage but this appears to have been an attempt to prevent the public release of information related to disease outbreaks like infectious salmon anemia. The Act contained the language that “a person must refuse, despite the Freedom of Information and Protection of Privacy Act, to disclose . . . information that would reveal that a notifiable or reportable disease is or may be present in a specific place”. Furthermore, the Act would have made the reporting on such outbreaks punishable by fines of up to $75,000 and two years in prison. Despite the knowledge that marine organisms will testify to the effects of chemical pollution first, 75 scientists are to be laid off from Canada’s ocean contaminants program. This will leave only 5 junior scientists to do ocean contaminants research in the country with more coastline than any other in the world. In the words of Dr. Peter Ross, who is world renown for his work on the bioaccumulation of contaminants in killer whales, this move by government qualifies as a “wholesale axing of pollution research” in Canada. 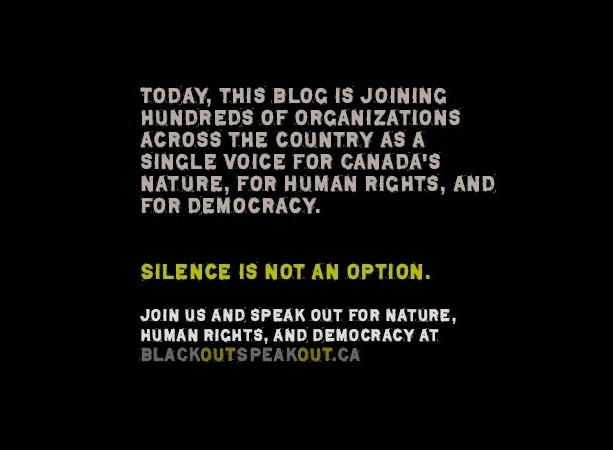 This is why I supported the BlackOutSpeakOut campaign on June 4th, 2012, wanting to do what I can to provide a powerful signal to government that we, the keepers of paradise, will not allow short-term economic “growth” to be at the cost of long-term environmental devastation. Click here for the top 5 reasons to Speak Out. Tag – you’re it dear readers. Please help raise awareness. For You For Oceans Day – for you love her as I do.